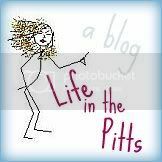 Life in the Pitts: Life is so much nicer when we are fighting. When Kurt gets mad, he stays up all night cleaning. When I get mad, I stop cleaning indefinitely. In this way, we are very compatible.